On 8th February 1941 the Kent Messenger reported one of Marden’s great tragedies of the Second World War, which had taken place 4 days earlier on the night of the 4th February. 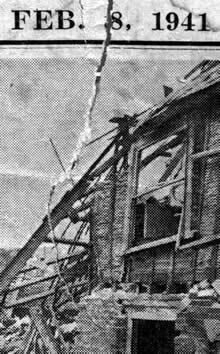 The night crew of the ARP (Air Raid Precautions) were enjoying a glass of beer in the Unicorn while an air raid was in progress when a terrific explosion shook the building. 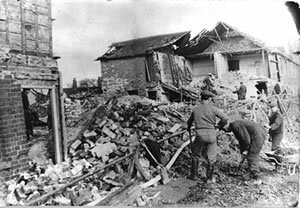 This was a bomb in the Maidstone Road: a German bomber returning from blitzing the capital, pursued by night fighters, had unloaded its unused bombs. They landed on two houses and two shops in the Maidstone Road, destroying them completely. It was an awful night recovering bodies. For some young men it was their first sight of the tragedy of war and death. Evidence of this tragedy can be seen today: the new properties which were built on the site are set back from the road and include the Chinese takeaway.